This is a beautiful Vintage collection of Victorian Santas in non traditional colored robes, as none of them are red! Although actually, they would have been traditional back in their day, before Santa started wearing his red suit, with stocking cap, he used to wear long Robes in different colors. I don’t have a lot of these images, but I’ve put together this little set of Blue robed Victorian Santas and some Brown Robe ones too. These are great to use in your Christmas Crafts when you want more of an Old World look! I’m sure you’ll find all kinds of ways to use these in your Holiday projects and decor. Some of these images are new to the blog and some have been here for awhile. This first image is a new addition to this site. Here we have a lovely Santa in a dark blue robe with matching hat. Both pieces are trimmed in white fur. 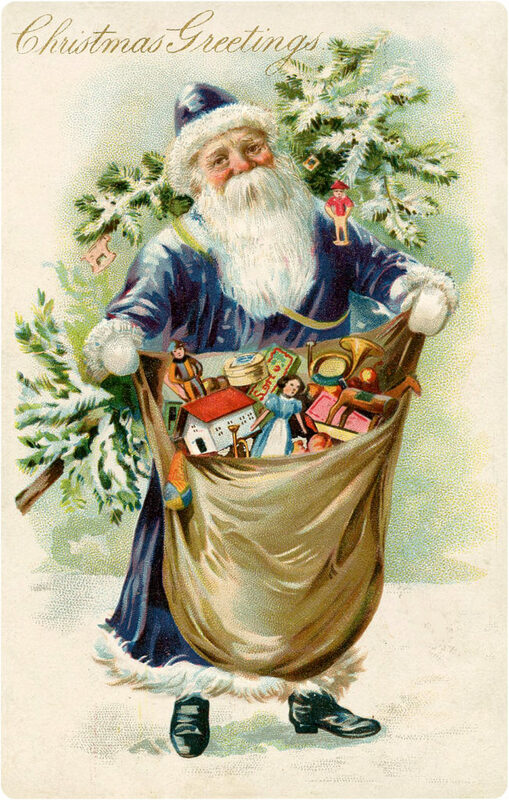 He has a fairly large Christmas Tree strapped on his back and he’s holding a big sack of toys! The Greeting is simply “Christmas Greetings”, on the card. Next we have a beautiful Old World Santa Scrap piece! This one has a Blue Coat trimmed in fur. He’s carrying a Basket with some Toys. The little Jester Doll is missing a leg and an arm, I left him that way … he made think me of the “Land of Misfit Toys” .. so cute! This is a very old Woolson Spice Co. card, showing a gorgeous colorful Santa, with his bag of toys. His dark blue suit is trimmed in brown fur instead of white. He’s leaning over the moon and looking at an ocean scene below. 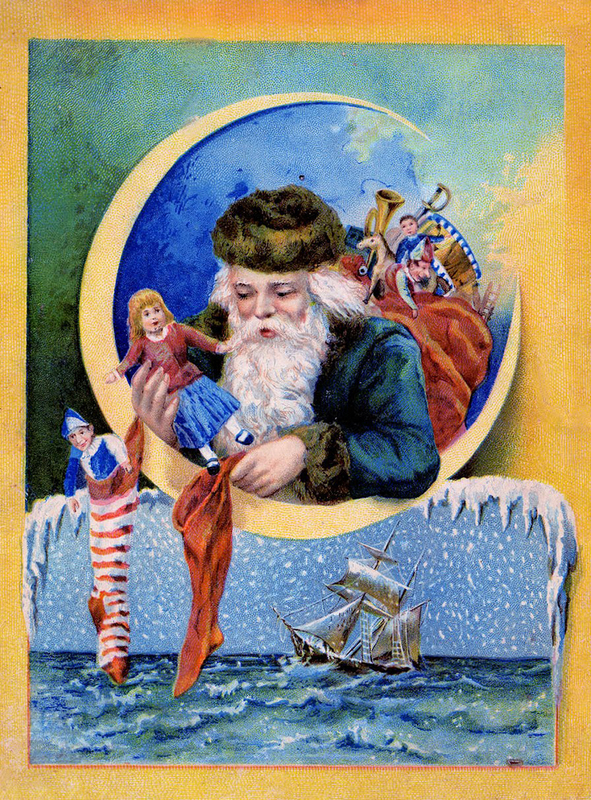 Such a whimsical piece, notice how Santa is hanging stockings on the Moon! 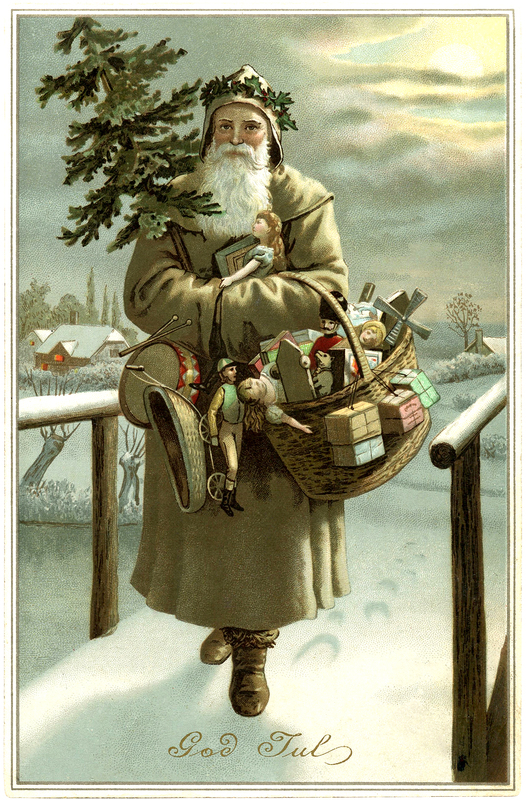 This is a beautiful Old World Swedish Santa Image and one of my favorites! 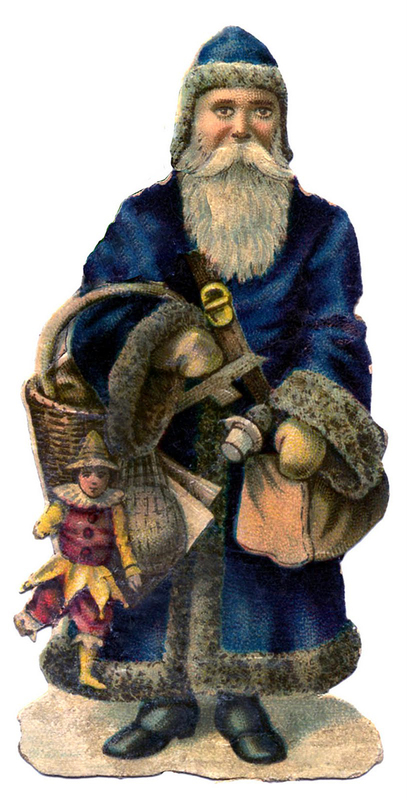 Featured above is a glorious looking Santa with a light brown coat, he has a Holly Wreath on his head and he’s carrying a small Christmas Tree and lots of Toys! The greeting on the card is “God Jul” (Merry Christmas), so I’m assuming it could be Swedish, but I know a few other countries use that same greeting so I can’t say for sure. 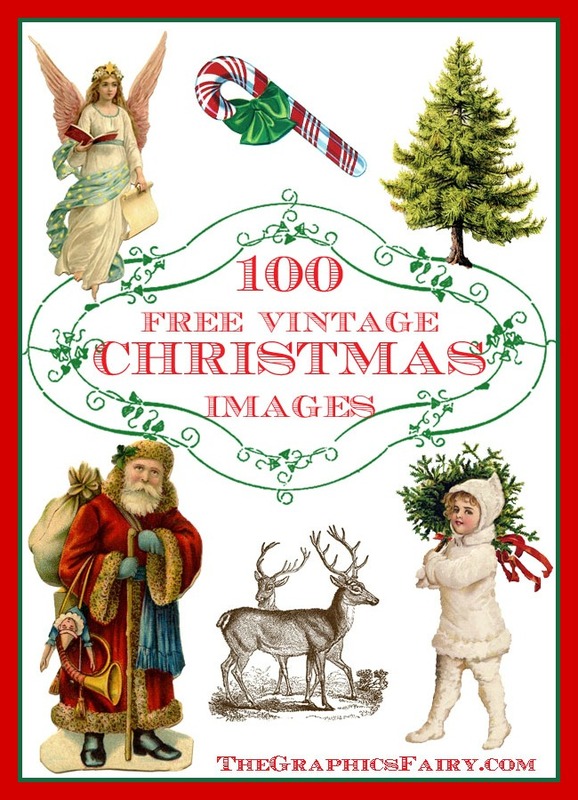 Such a gorgeous image for your Vintage Christmas Craft Projects! 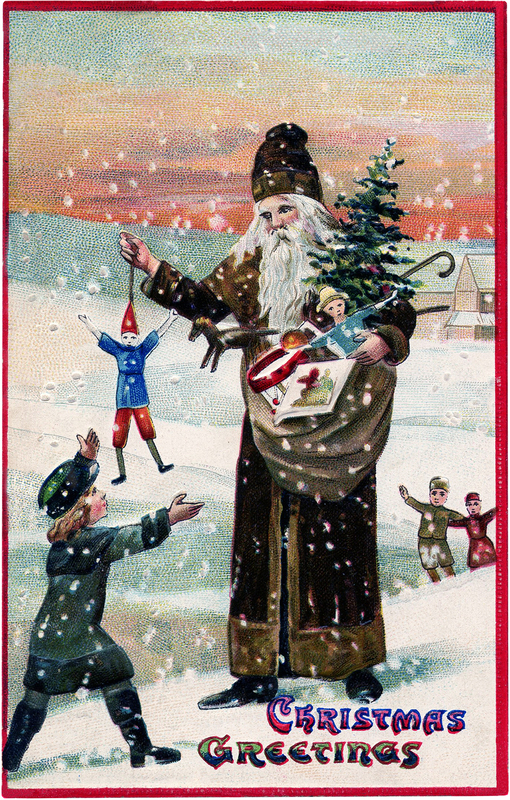 And lastly we have this marvelous old Christmas Card featuring an Old World Santa, in a Brown Robe, he’s got lots of toys to hand out to the good girls and boys and a tiny tree too! The scene around him is a snowy one. You can see that the children have spotted him and are all running towards him. I hope you enjoyed this collection of Santa’s in their different color robes. For even more Fabulous Holiday Clip Art, be sure and check out the 115 Best Christmas Images HERE! 6 Santa Illustrations – Black and White 10 Santa Sleigh Images and More! 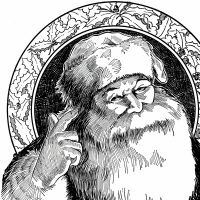 6 Santa Chimney Clipart Images – Color & BW! This is a beautiful image! Thanks! Beautiful image! Thank you so much! He is lovely, thank you Karen! Love this one THANK YOU! You´e right, this is a Swdeish Santa! And..od Jl i only sad in S, my home country Sweden. This is WONDERFUL! I used it for my header on my blog-I would love to give you credit but am not sure how to do that. Any suggestions? Thank you for all the beautiful images you share with everyone! All of these are wonderful and a few will be tags for my gifts. Thank you! 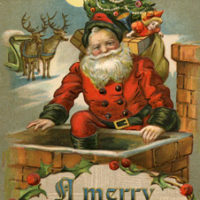 Hi there, your vintage photo’s etc are super but this lovely Santa is exceptional, thanks so much for sharing!!!! A wonderful collection of Christmas images. Have request permission to use in my Christmas presents. This is so beautiful and definitely a swedish one. I will use this in my gift tags, too. Thank you again. Your site brings so much joy for me and hopefully to people around me (those who get the presents). Happy holidays! Love it… DO you have any Santa’s By the SEA ? I saved them all. These Santas were all in fashion – we have red now with a black belt. I’d rather see these – they are awesome – each and every one of them!